Educational programs, and Ecological restoration programs are just some of the things you will find here at the Marine Discovery Center. Come rent a kayak and go on a self-guided tour of the Indian River Lagoon, or go on a Guided Tour , and discover some wildlife up close and personal. 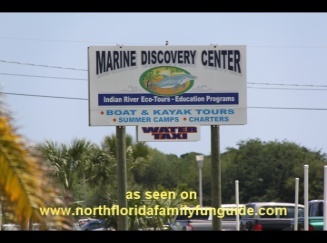 Board the Marine Discovery Center Ecotour for a guided 2 hour adventure up the Indian River Lagoon, and get some hands on learning experiences with edible seaweed, and living creatures such as oysters, barnacles, and snails, and hermit crabs. The Marine Discovery Center hosts summer camp programs, birthday parties, and more! They have an injured waterbird rehabilitation program which offers rescue and immediate assistance to injured water birds, and then transports them North on the Intracoastal, to another rehabilitation facility for further treatment and hopefully re-entry into the wild. During our visit we were fortunate to see two small islands which had become a nesting sanctuary for pelicans, egrets, and cattlebirds, with active nests and hatched young that were being cared for. It was an amazing sight!